This design is free from the Plymouth Yarn website. 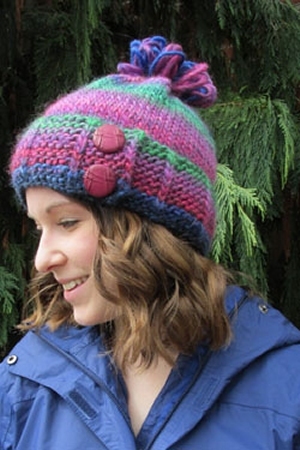 Slip stitch patterned hat with button embellishment. This design is free from the Plymouth Yarn website. Remember to download or print the pattern by following the link provided on this page, as it will not be shipped with the yarn. Size US 10 - 16" circular needles, US 10 double point needles, two 1.25" buttons, and a stitch marker are required but not included. Gauge: 14 sts over 4"